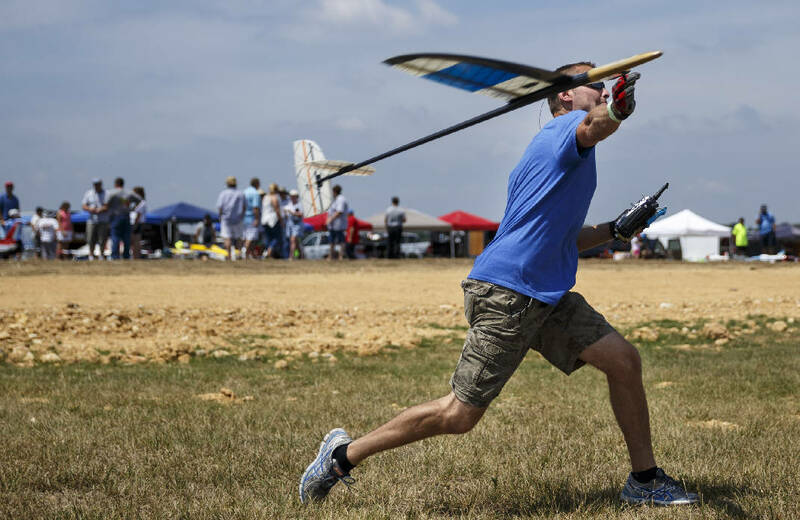 At last year's air show, Neil Baker throws a discus launch glider, which is radio controlled and uses air currents to remain aloft instead of a motor. For the sixth year in a row, the Chattanooga Radio Control Club is hosting a public air show to benefit Siskin Children's Institute. This year's Siskin Air Show is Saturday, Sept. 16 from 10 a.m. to 2 p.m. at Summit Field in Ooltewah. CRCC members invite families to view sky-wide acrobatics by remote-controlled airplanes, high-performance jets, helicopters, quadcopters and more. The gravity-defying stunts — performed at speeds of up to 170 mph — draw crowds of hundreds every year, said club member and event organizer Tony Bosco. This year, kids and adults can participate in the action from the "buddy box," where they can remotely pilot their own plane alongside a club member. "It's always fun introducing a new generation of kids to the hobby of flying radio controlled planes," Bosco said in a release. All of the money raised will benefit Siskin, directly impacting children with special needs. "We hope to have a sizable check to present to Siskin again this year, and a lot of that depends on who comes out," Bosco said. "It's a lot of fun, and the weather is supposed to be really good." Siskin's developmental pediatric program served over 13,000 patients from six states in the 2015-16 fiscal year, and its Early Learning Center welcomes 150 students, both typically developing and special needs children, to learn side by side. The CRCC invites the whole family to attend the fundraising event at 4223 Old Woodland Drive. Admission is $10 per carload and snacks and drinks will be available for purchase. Cash only; no credit cards accepted. Learn more about the Chattanooga Radio Control Club at crccflyer.org. For more information about Siskin Children's Institute, visit siskin.org. Email Heather Newlin at hnewlin@timesfreepress.com.